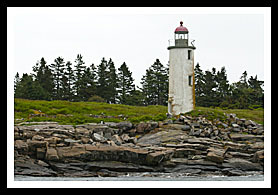 Franklin Island Light is located near Tenant's Harbor in Maine's Muscongus Bay. Lighthouse and island are closed to the public. Franklin Island contains many treacherous rocks that caused many shipwrecks on or near the island with the increased shipping trades developing in the 1800’s. Franklin Island lighthouse was constructed on the island in 1807 to help guide this increasing traffic in the vicinity of Muscongus Bay. Even with its five-mile distance from shore, keepers were only supplied a tiny rowboat to use for transport. George E. Woodward served as keeper from 1924 to 1926. On January 9, 1925, Woodward was in very poor health at the time, which nearly kept him from completing his duties on the lighthouse and building. He suddenly heard a distress signal and went to the assistance of a fishing party marooned near the station. Even in his exhausted condition, he brought the men back to the lighthouse, provided food for them, and loaned them his small boat so they could get ashore. His son, Coleman George Woodward, was often called on to fill in for the keepers who were given twenty-eight vacation days each year. As there were no telephones on the island, the keepers, when in need of assistance, would fly the American flag upside down from the top of the tower and hope ships passing by would see the flag. Franklin Island is part of the Maine Coastal Islands National Wildlife Refuge. There are no boat tours offered on a regular basis. You will need to charter a boat out of Tenant's Harbor to get out to the lighthouse about 5 miles from shore. Off Route 130 in New Harbor, Hardy Boat Cruises, provides cruises out to Monhegan Island, puffin tours and seal watching, and coastal tours in the fall, which may pass by Franklin Island Lighthouse. They also provide an educational history cruise out to Pemaquid Point Lighthouse and Fort William Henry. Once a year over the past few years there has been a tour put on by the American Lighthouse Foundation, as part of the Midcoast Maine Lighthouse Challenge events, in an effort to raise money for lighthouse preservation projects. The boat, the P/V Elizabeth Anne, leaves out of Port Clyde Harbor on route to Boothbay Harbor and back. They provide nice close up views of Franklin Island Lighthouse. The boat tour is just part of the weekend long Midcoast Maine Challenge, where you can also spend the weekend visiting other Maine lighthouses, and in many cases you can go up into the towers of select lighthouses. This boat tour usually occurs before July 4th weekend, and will depart rain or shine in most any weather.